SMART-BURN Technology The Lite-On iHAS124-04 DVD burner is equipped with advanced SMART-BURN technology to avoid Buffer UnderRun errors and automatically adjust writing strategy and running OPC for the best burning quality. Pros: Works as you'd expect to. Cons: Stopped ejecting after about 2 years of use. Other Thoughts: Bought a used drive from a local PC shop shortly after to add another drive to my system. That one is still going strong while this one just plain stopped ejecting - even when you tried to manually open it. Replaced it with a spare that I had sitting around and tossed this one. Pros: 1. Quite affordable when I got it, only $15. Might be kind of hard to find this old model for that much, but there are modern equivalents just as cheap. 2. Supports read/write operations for CD and DVD. 3. Pretty fast for an optical drive. 4. Still works perfectly after about two and a half years of irregular use (don't often have to use it, but when I do I often have to use it for several hours at a time). 5. Sturdy. Survived a seven foot drop onto thin carpeting soon after I got it. Cons: 1. No Blu-ray support, but that would cost at least an extra $30 (plus the cost of software that supports Blu-ray's proprietary nonsense). Meh, who needs it. 2. The old motherboard I was still using when I first got it couldn't detect it, though I'm not sure if that's more a failing of the cheap drive or my old cheap board. More modern boards don't seem to have any trouble with it, anyway. 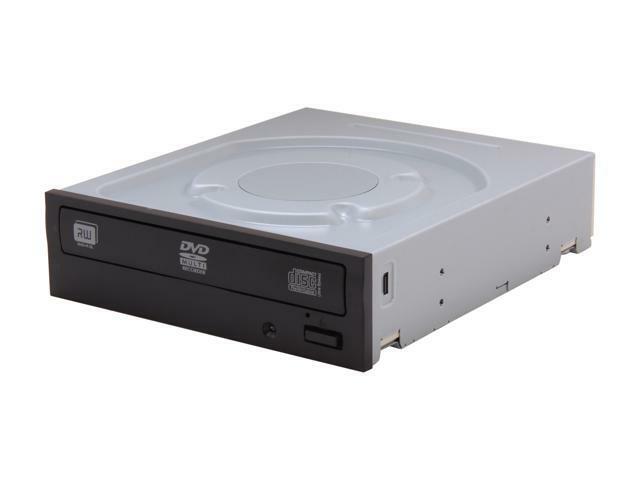 Other Thoughts: This is a good optical drive, which is something I still recommend anyone building a rig get one of. They're dirt cheap, and you might be surprised how many installation disks you get even these days. Plus being able to burn disks or play DVDs is always nice. Pros: Black front plate matched case. Cons: Bought at the end of May. Within a month it started spitting out coasters on me. DVDs were skipping and freezing half way thru movies ( after burning them ). Loud clicking noises when burning sometimes too. Tried different media and it was hit or miss. it was a flip of a coin if I got a good burn or bad burn. Other Thoughts: I made another review about 2 weeks ago on this but that was before this started making coasters on a consistent basis. So i had to write a new review. Was going to return it but it was after 30 days but don't feel I should have to pay shipping on it. Update: 4/9/2017 Its officially dead. Won't read anything now. Just grins and spins. Pros: Very good drive been going 7 yrs without any issues. Cons: no cons at all with this one. Other Thoughts: Had this in my system for going on 5 years. Not so much as a hiccup. It's a DVD Burner, what do you want?